With the aid of SIGMASOFT® Virtual Molding, an automotive supplier was able to select a new mold alloy for a challenging application, reducing the molding cycle by 20% without changing the part design. based alloy and a hot-work tool steel. "In both cases the objective was to reduce the cycle time, ensuring the required part quality and a long tooling life," stated Manuel Schmellenkamp, SIGMA Engineer responsible for the project. The pressure to reduce cycle time is common for every molder. In this struggle, there are several actions that can be considered: changing the mold tempering concept, reducing wall thickness in the molded part, changing the processing parameters or modifying the resin formulation. There is also another possibility that is not always considered: changing the mold material for an alloy with a higher thermal conductivity. This article's example illustrates the advantages of this approach. Here the mold material was only locally modified, while a substantial reduction in cycle time was achieved. Notably, higher thermal conductivity sometimes results in lower hardness values and care should be taken to select the appropriate material. In Germany, an automotive supplier was molding a technical product that required a cycle time longer than expected. SIGMASOFT® Virtual Molding was used to analyze the current production and find a solution. The desired mold temperature was 80°C, and the tempering channels were running in a range from 60 to 80°C. After simulating 20 consecutive molding cycles the hotspots in the mold, responsible for the extended cycle time, were evident. Due to the complicated part geometry, it was not advisable to machine new tempering channels (which could compromise the mechanical integrity of the mold). A part redesign was also out of the question. distribution in the mold. The temperature in the hot spots dropped from 147°C to about 92°C, and the mean mold temperature reduced from 95°C to around 85°C. "It was a substantial improvement in the mold temperature," Schmellenkamp explained. "However, the molder was concerned with the lower hardness of the alloy, which may lead to wear and reduce mold life." The typical hardness for this type of material is 33 HRC. A second analysis considered the possibility of using special hot-work tool steel. This material has a higher thermal conductivity than regular tool steel (60 W/m²K), and though the ability to remove energy from the melt is not as high as with the copperberyllium alloy, it delivers a higher wear resistance, due to its improved hardness (around 44 HRC). 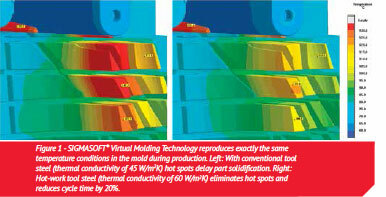 The SIGMASOFT® Virtual Molding analysis proved that the hot spot temperature could be reduced from around 147°C to 120°C and in some regions from 119°C to 102°C, as shown on the right side of Figure 1. "This material selection delivered the best compromise between both alternatives: high wearing resistance and high thermal conductivity," concluded Schmellenkamp. "The molding cycle was reduced by 20% without changing the mold design." According to Schmellenkamp, this increase in productivity is easily achievable in existing molds. "It is not uncommon to accomplish this reduction in cycle time for several existing molds within a single company, resulting in up to 15% more parts produced in the same period of time."